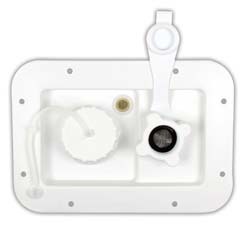 Easily installed water fill center comes with both city and gravity fills and is built for convenience. No doors or locks and mounts in a low profile setting. Includes replaceable plastic city water fill check valve. Built with a 1/2" screened air vent for ease of use. 1 per pkg. Manufactured by JR Products.